A momentous day for Waikohu. Waikohu players, coaches and support staff have celebrated a momentous day in the club’s history — their first Poverty Bay premier club rugby title. 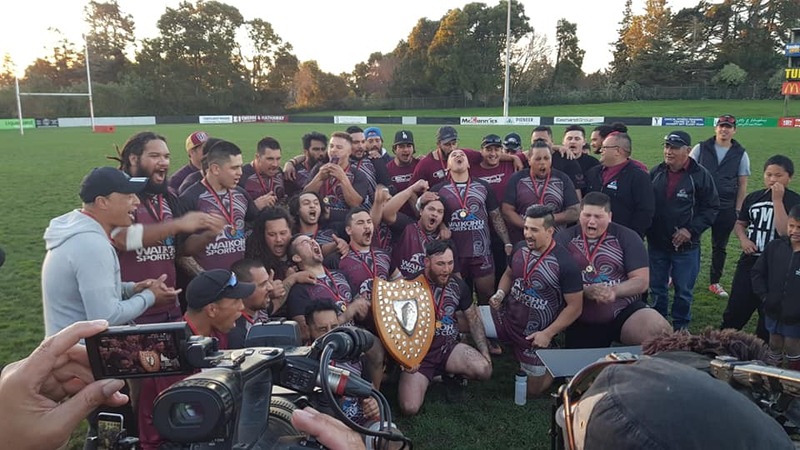 GT Shearing Waikohu, cheered on by what seemed to be most of the Te Karaka community, defeated East Coast Farm Vets YMP 40-26 in the Lee Bros Shield final at Rugby Park on Saturday. Runners-up last year, Waikohu trailed early in the match but stunned their opponents with four tries in less than 20 minutes in the second half. The final was preceded by a stirring haka stand-off between the sides, and the match itself was a gruelling and physical battle that ended in history being made. The coaches of Lee Bros Shield finalists Waikohu and YMP were under as much pressure as their players heading into the showpiece of Poverty Bay club rugby. And they were under no illusions as to the difficulty of the task their teams faced. “We knew we would have to weather an early storm from YMP, having played them twice before, but once we did that and started to get some ball, I was confident we could win,” said Waikohu coach Jason Tuapawa, a Shield winner as a player with Pirates. “I don’t mind admitting I felt more pressure today as a coach, especially having been brought up in Te Karaka, and with the expectations of the community. “The boys who played in last year’s final told me they felt they were overawed, more hyped up — it being their first final — and not mentally prepared to win the match. YMP coach Steve Smith reluctantly admitted the better team on the day won. “It’s a cliché I don’t particularly like,” he said, before adding, “but yeah, they were better over 80 minutes. Any rugby coach will tell you the battle is won up front. It was the Waikohu pack — Jarryd Broughton, Geoff Pari, Toru Noanoa, Richard Green, Te Miini Kohere-Smiler, James Rutene, Lynden Manuel and Ken Houkamau — who earned the plaudits, with Green, Kohere-Smiler and Houkamau the main contenders for man of the match. Green and Kohere-Smiler are the two smallest locks I have seen in almost 31 years of covering sport but they were magnificent. However, Houkamau gets my vote. The former Pirates skipper joined Waikohu this season after Pirates withdrew from the premier division. Not only did he keep his promise to coach Jason Tuapawa that he would score a try in the final, after going through the season without crossing the tryline, he was everywhere — tackling, setting up attacks, supporting the ball carrier and winning lineouts. Throw in the call to take the three points instead of going for a lineout, and Houkamau is a worthy winner. Halfback Mario Counsell, left wing Kirwan Ratapu and centre Larry Fleming often get overshadowed by Ethine Reeves, Kelvin Smith, Jesse Fleming and Tawhao Stewart, but they all played their part in making it a day to remember for Waikohu. The last word goes to Tuapawa. “I wouldn’t single out any individual,” he said. “This win is for everyone in the squad. I know when I make changes and put on the reserves I have players who will make an impact and it’s been like that all season. A report on the Lew Patterson Cup final for the senior one title will be in The Gisborne Herald tomorrow.